A descriptive essay is written to explain a subject through an in-depth, specified and sensory inspection. It includes a powerful use of words and all the human senses brought together to understand a bring the attention of the reader into the subject. Through a descriptive essay, one can sketch out the details about a person, place, an observable fact, memory, experience or a thing in the reader’s mind. Often, a specific purpose is required to write a descriptive essay, so as to explain specific details about the subject. for example, if a person selects to write about the Milky Way galaxy, there are ample number of things that can be talked about, such as the birth of the galaxy, about the planets, comparison with other galaxies etc. out of these, is it later decided that the birth of the galaxy interests him the most, thus it becomes the subject. 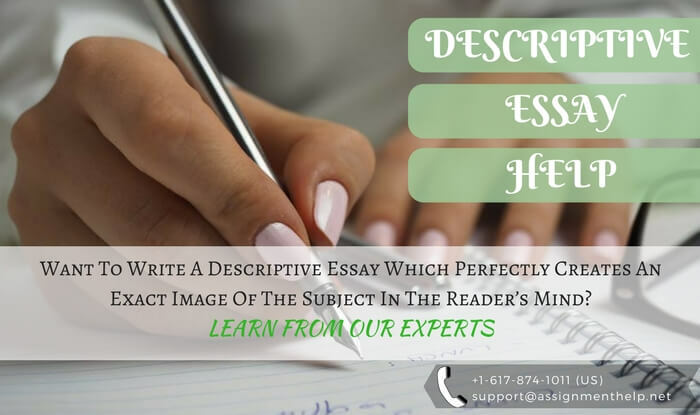 To write a descriptive essay which perfectly creates an exact image of the subject in the reader’s mind, there are some important steps which are listed below. The more you grind your brain to think of a topic, the better the ideas will come up for you. Out of all those, pick the one which you feel you can describe really well. A great subject picked out from the rest may sound well, but if you are unable to explain would not make much impression. Whereas a simple topic with a thorough description can surely make your grades better! Thus, remember that it is the description which matters more, rather than what you describe. Touch: Holding the partner’s hand, swirling around your partner when he released you out of his arms, firmly holding hands while making a move together, the texture of the wooden floor etc. Smell: The lavender room freshener of the studio, your partner’s perfume etc. Sight: The lights at each corner of the studio, your partner’s face, other couples dancing around you etc. Taste: Juice that you drink during breaks. Sound: Beats of the music playing, loud counts of instructor etc. Once you have made the list, pick out the ones which you are actually going to include in your essay. Not all the details may be worthy to be included. For a better essay, include the features which can be described well. Begin your essay with an attractive line which relates to your subject and one that draws your readers’ attention. The introduction is the part where readers would get to know about your subject. Thus, give a brief about the subject and what draws your interest into it. A good introduction makes to the readers read further. Thus, choose the words you write wisely. It is here that the content of the subject should be discussed. Follow the given guidelines which will definitely help you in writing an essay that impresses everyone. As stated earlier, the descriptive essay is all about how well you describe a subject. A good use of adjectives can surely help you in your work. Put together all the qualities which you have to describe your subject and find relevant adjectives that add to their meaning. See that, just adding a relevant word or a phrase to your interpretation adds so much depth to your ideas! Apart from telling how you feel about the senses, you experience about the subject, emotions too should be depicted. Think deeply about the topic and collect all the emotions which you feel about it and express them well. The last section often leaves the lasting impression on the readers’ minds. A strong conclusion is a must for a successful description essay. Write a note about the overall views you have about your subject and how it impacts your life. Also, the conclusion should be in a positive direction to add further value to the essay. Thus, focus on the positive and inspiring features of your subject for your conclusion. Now that you know how to frame the perfect outline for your essay, follow these easy tricks to write a remarkable description essay about your subject. The subtopics which are to be included in your essay are to be planned in the outline too. Each paragraph should discuss one subtopic to maintain clarity of ideas and avoid any confusion. Include the explanations about the senses and examples in the same paragraph about the subtopic. It is always better if you correct your own errors before someone else points them out. Well, do the same for your description essay too. Once the essay is complete, read it, again and again, to pick out any errors. Look out for the spelling mistakes especially, which is the most common of all mistakes. Grammar should be correct too to interpret your ideas in the way exactly you want to. Decorating your essay with figures of speech will surely add depth to your words, but too many figures of speech may simply steal away the essence of it. Do not end up with describing a single sense with multiple figures of speech. It would be too much if you use alliterations, personification and smiles all at once to describe just one emotion or sense, and it may turn out to be meaningless in the end too. Keep it impactful by using one figure of speech to describe one sense or emotion. Included in the introduction itself, a thesis statement is a sentence which states the objective of your description essay. It is a crucial part of the essay as it introduces your subject to the readers and also what you intend to interpret in the essay. Do not conclude with simply restating your subject. The conclusion is the part which the readers are most likely to remember later, as it is the last section of writing. Hence, it must be impactful and leave a thoughtful idea in the readers’ mind about the subject. Do not simply state the topic again, which would spoil the entire impression! Talk about how does the subject impact your life, or write a brief note about the emotions and descriptions of the senses, taken as a whole. It is always good to end with an inspiring line too which is relevant to your subject.